What do Albert Einstein, Abraham Lincoln, Mozart, and University of New Brunswick student Nick Peardon have in common? They all either have, or were suspected to have, Asperger's Syndrome. Peardon, a second year Bachelor of Arts student, wants to educate others about Asperger's Syndrome (AS) and what it is like to live with a disability in today's society. The most important thing he wants people to remember is that even though he has Asperger's, he is just like everybody else. Currently, Peardon lives in residence at UNB and enjoys meeting new people and making friends. One of his biggest passions in life is hockey, and in 2012 he and his twin brother won a national contest naming them the "Biggest Most Passionate Montreal Canadiens fans." Peardon has always been interested in the justice system and law, and his career goal is to become a criminal lawyer. He loves to write,mostly short stories and poetry, and hopes one day to write a book about what it has been like to live with Asperger’s Syndrome. When asked why he chose UNB, Peardon immediately listed several reasons. "Their [UNB's] hockey team is one of the best franchises in Canada and I wanted to be a part of that community," said Peardon, "UNB also has a prestigious law program, which is important to me, and I wanted to be close to my twin brother, who goes to St. Thomas. The additional perk I discovered when I came to UNB was the accessibility services centre for students with a disability." Diagnosed with AS this past December, Peardon said finding a name for his condition has been an ongoing process throughout most of his life. "Since I was five years old, I've been examined by lots of specialists and doctors who never could really put their finger on what I was living with." Finally, a clinical psychologist assessed him in his home province of Prince Edward Island and the findings indicated he had AS. "Based on my own reading and research on Asperger's, the diagnosis fits me to a T. It was great to finally get that closure. Instead of living with the uncertainty, I can move into the coping phase and just manage it," said Peardon. Asperger's Syndrome (AS) is a developmental disorder on the Autism Spectrum, characterized by difficulties in social interactions; restrictive and repetitive behavior patterns; and an intense interest or preoccupation with a narrow subject. Peardon explained that Asperger’s affects cognitive function and his greatest challenge is social interaction. Understanding social norms and cues, maintaining eye contact, prolonging a conversation, and recognizing sarcasm or humor are all things he deals with on a daily basis. "Because it's hard for someone with Asperger’s to detect sarcasm or humour, it's easy to misinterpret what people are saying sometimes, said Peardon. "I might not realize when someone is joking, because I take things so literally. You really have to take a step back and assess the situation before you react." 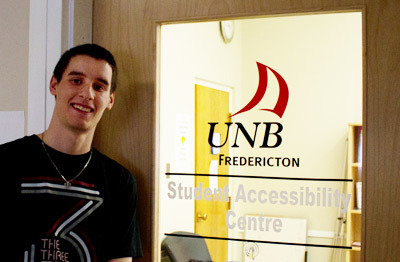 Once he had a diagnosis, Peardon decided to contact the UNB Student Accessibility Centre (SAC) to find out more about the resources and services available to students with AS. "I'm glad I took the first step in coming [to the Centre]. Because there is a stigma, people like myself are kind of worried that we might be labeled if we have a disability," said Peardon. “The staff at the Centre has gone above and beyond for me. They even helped me find a part-time job. It’s been a great experience here." "Our goal at SAC is to break down the barriers for students with disabilities," says Jody Gorham, director of the Centre. "We do this by providing resources and services to students and collaborating with and training staff and faculty." The Accessibility Centre staff helped Peardon prepare a Canada Study Grant application to provide him with a laptop and software to make his studies easier, and they set him up with a tutor that he meets with once a week. The centre also referred him to UNB's counseling services. "There are many famous and successful people with Asperger's,” said Peardon with an excited smile. "The sky's the limit. It's a myth that people with mental health issues or disabilities are limited in what they can do. There are people out there who are pushing the boundaries and doing great things every day. Everyone has something to offer the world, especially people with disabilities." The UNB College of Extended Learning (UNB CEL), in partnership with the UNB department of psychology continue to build and grow programs to help New Brunswick build core expertise to support anyone working in the field of behavioural intervention. "We know that this is an area of support that is lacking in our province currently. We would like to help remedy that as an institution, said Lloyd Henderson, executive director of UNB CEL." Currently, UNB CEL offers training programs for front-line practitioners, caregivers, healthcare professionals, and others who support people with various concerns related to the autism spectrum and other behavioural disorders. To find out about the upcoming Behavioural Intervention Workshops or the Support Training programs contact Dawn Dignam. Statistics indicate that approximately one in 88 children* are diagnosed with Autism Spectrum Disorder--and the number is on the rise. The University of New Brunswick, through the UNB Student Accessibility Centre, provides services and support for students with Asperger’s Syndrome (AS) and others with disabilities to help them achieve personal success with their educational goals.